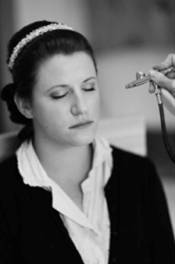 Airbrush make-up is a technique which has been adopted by make-up professionals, which allows different forms of make-up (such as foundation, blusher, bronzer and contouring products) to be sprayed on to the skin via a fine mist, which is dispersed via an airbrush gun. Traditionally this form of make up application was used in the tv and film industry and even more so with the developments of HD filiming. However, it is now becoming increasingly popular in the wider make-up industry, including bridal, due to its flawless finish and excellent durability. Traditional foundations can look obvious, caked on and feel heavy. Airbrush make-up leaves a light, seamless veil of colour over the skin, allowing your true skin tones to show through without masking your face in heavy foundations. With ease, it is possible to custom blend shades to acheive a perfect colour match that is individual to you, resulting in a more natural look that covers skin imperfections effortlessly. As the make-up is sprayed, it provides excellent blending results, so you won't know where your make-up ends and where your skin begins. The airbrush also has hygiene benefits, in that it prevents product contamination and the spreading of bacteria. With the make-up being so light your skin can still breathe! Airbrush make-up is preferable over the more conventional methods of application (using a brush or sponge) because the particles are tiny when sprayed, allowing the particles to sit evenly on top of the skin's surface, resulting in a completely flawless, and weightless, natural finish. 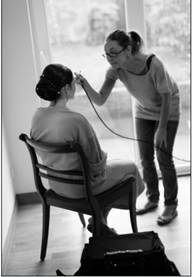 Airbrush makeup can provide a sheer or opaque coverage, making it the perfect choice for all skin types. It minimises skin imperfections and gives skin a natural look. 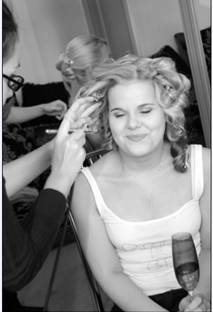 The brand of make-up used is called Airbase and is developed especially for the airbrush. The products are silicone based and therefore water resistant, meaning perspiration and tears are no longer a problem. The make-up is also smudge-resistant and won't rub off on clothes, fade, melt or drop, meaning there is no need for touch ups due to its long lasting properties. Airbrushing can also provide optimum coverage, concealing skin blemishes, skin discolouration and even tattoos and birthmarks. Airbrush make-up is also ideal for sensitive skins because it means that pressure does not have to be applied to the skin in the usual 'rubbing fashion', which can often result reddening of the skin and stretching over time. "Airbrushing is the leading make-up artists' best kept secret. I have been using airbrush make-up for the past 4 years and wouldn't look back. Now I don't apply make-up in any other way, because the best results are achieved from using the airbrush and I always receive 100% satisfaction from my clients. As a consequence the majority of the images on this site show looks using airbrush make-up. I love how the skin looks dewy, fresh, radiant and natural. It covers blemishes superbly and the way it lasts is amazing. Celebrities often insist on having their make-up applied using the airbrush because they know their skin will not only look fantastic but feel good too"